Like we’ve said before there are many benefits to taking a commercial whitewater trip, the main perk being that they take care of everything–all food preparation, shuttles, and gear are provided for you. Also, if you are not quite ready to tackle a class III+ rapid on your own, Banzai rapid will be included and expertly run. If you are in the early stages of commandeering your own raft or kayak, it’s recommended that you put-in below Banzai rapid on the beach. There are no river permits required to raft or kayak the Banzai run and on top of that there are also no fees for camping or boat launches. 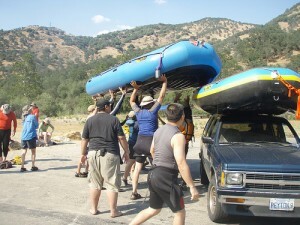 Since there are no fees for camping on the river, an overnight trip is a great idea during a multi-day river trip. If you would like to camp before or after your trip the convenience of having both put-in and take-out at campgrounds brings the a certain little jingle to mind…”double the pleasure, double the fun!” If these campsites are filled during peak season then head on over to the Kings Canyon National Park campsites. The busiest time of year on the river is Memorial Day weekend and, for that matter, pretty much every weekend in May. If you don’t like fighting for riverside camping and aren’t looking forward to a traffic filled, dusty road leading to the river it’s best to avoid this time of year. It is 10 miles from the Garnet Dike campground to the Kirch Flat camp and picnic area. So, you’re looking at a 35 minute drive because 7 of those 10 miles are on a winding dirt road. Take-out: From Highway 99, take highway 180 in Fresno east to Centerville. Take a left on Trimmer Springs Road and drive through Piedra. Doyal’s Store in Piedra is the last gas station until you get to take-out, which is 30 miles away. Once you get to the north side of Pine Flat Reservoir be prepared for a winding 30 mile car trek to Kirch Flat Campground. Those who suffer from carsickness are forewarned that those 30 miles are a doozey. Put-in: Travel upriver on Trimmer Springs Road, cross a concrete bridge, and continue on paved road to Rodgers Crossing bridge. You will see a dirt road that bears right along the south bank. It leads to more campgrounds at Mill Flat Creek. Stay on the paved road and cross the bridge, turn right onto another dirt road and drive for 7 miles until you reach Garnet Dike put-in. From here you can scout Banzai rapid.